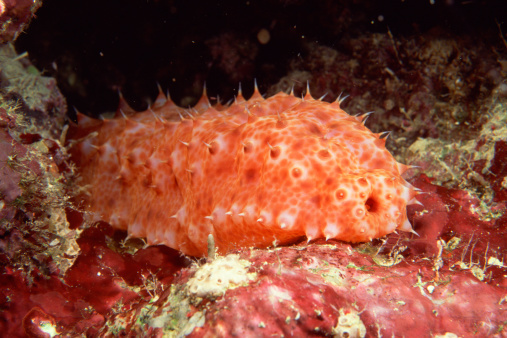 Researchers at the Robert H. Lurie Cancer Center in Chicago have discovered a health breakthrough in the fight against cancer, and it involves the lowly sea cucumber. Of course, sea cucumbers are not really cucumbers at all. Sea cucumbers are actually marine animals that have a soft body with the shape and texture of a cucumber. There are more than 1,000 species of sea cucumbers that range in size from one inch to several feet long. Sea cucumbers are found in all oceans, especially the Indian and the western Pacific.You’ll want to know a little back info about sea cucumbers. Sea cucumbers don’t rate high in the world of animals. They are bottom-dwelling marine creatures that feed on organic debris on the ocean floor.Though seemingly completely unremarkable, they have developed a very interesting defense mechanism: they basically expel their entire insides (organs and all) to escape from predators. After avoiding a predator — and this is the really remarkable part — sea cucumbers can regenerate their entire insides in a few months. Perhaps this is the clue as to why sea cucumbers may contain healthy substances that could benefit humans. Now — back to the study. The Chicago research team investigated the effects of sea cucumber on cancer prevention. They studied the growth inhibition and death in human pancreatic cells. Researchers found that sea cucumber stopped cancer cells from spreading and activated a process that killed the cells — and this happened within five minutes of the cells being exposed to the extract!The researchers concluded that sea cucumber extract causes cell cycle arrest and apoptosis (cell death) in human pancreatic cells. They recommended that, because sea cucumber extract is edible and nontoxic, it may be valuable for nutritional therapy or prevention of pancreatic cancer. You can find sea cucumber extract in the form of a dietary supplement. It may be either alone or combined with other ingredients (usually in supplements promoted for joint health). The supplements contain ground, dried sea cucumber pressed into tablet form. Sea cucumbers, like all other animals, are made up of thousands of chemicals, so the exact ingredients of supplements will likely vary between products. If you are allergic to seafood, you may want to avoid sea cucumber.